Before you start planning a travel budget based on budget prices, remember though that the average budget hotel cost is just that, an average - probably brought down by a fair number of doss houses and Fawlty Towers-type establishments. Beware of super cheap offers which may be almost impossible to pin down. Formerly known as The Cottage Hotel, Hotel Noir is a historic Victorian building that has been undergoing renovation. At this writing, the 28 ensuite rooms have been restyled in the hotel's signature black and white design. Rooms are small but comfortable for the price with free wifi and cooked breakfasts included in the rates. There's a free private car park and, during race days, a free minibus service to York Racecourse. And, most unusually, the mini bar - topped up with beer, wine, and soft drinks daily - is free! A circa 1827 Georgian Mansion, the Churchill Hotel was, for many years, a government building. It became a hotel in 1985 and in 2006 underwent a £2million renovation. The 32 rooms are stylishly modern and excellent value. A standout feature of the hotel is an elegant traditional Georgian grand staircase rising up to an atrium. 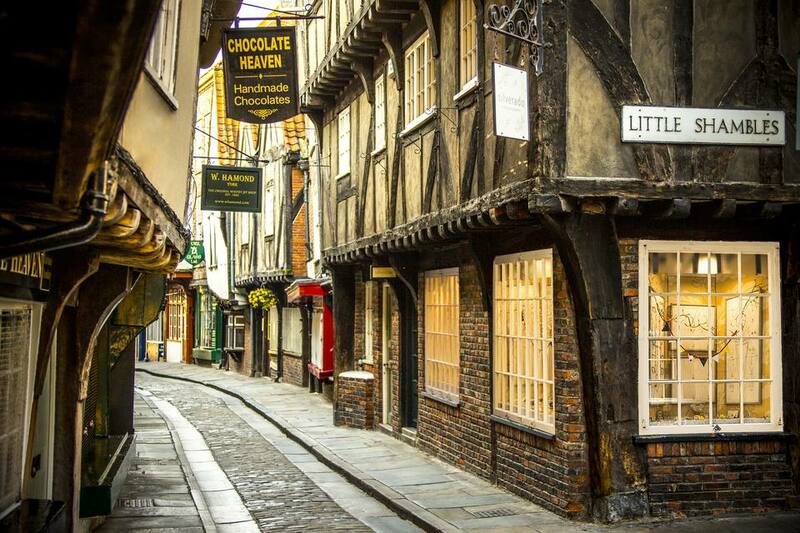 It's also well located, just outside Bootham Bar, gateway to the heart of Old York. The rate for a standard double is slightly over £100 but good deals are available online. And two-night, midweek York City breaks include breakfast and dinner for two on both nights, bringing the real rate well under £100. You know what to expect from a Holiday Inn and this one delivers that. Clean, recently refreshed rooms with modern bathrooms. Internet access is available but a bit expensive and breakfast adds a tenner, per person, to the price of a room. On the plus side, this hotel overlooks York Racecourse and is only a mile and a half from the center of York. It bills itself as family friendly and double rooms with sofa beds that sleep a third guest free are available. The hotel also participates in Holiday Inn's Kids Eat Free offers. Reliable French operated Novotel is on the river Foss, 5 minutes east of York center. The hotel has an indoor swimming pool, children's play area and 24-hour room service. Family-friendly, its standard rooms have sofa beds and can accommodate up to 4 people. Kids stay free - two children under 16 stay free when sharing a room with parents or grandparents and breakfasting together. Be careful as some extras can add up - there are fees for parking and internet use and breakfast is not included in the rate. The Crescent House is a nice, 3-star Georgian guesthouse in the Bootham area of York. Rooms have flatscreen tv with digital Freeview, radio alarm clock, hair-dryers and courtesy trays with local teas, coffees, and hot chocolate. WiFi broadband is available for a fee. The owners make a point of their family friendly credentials. Cribs, called cots here, highchairs and baby changing facilities are available. Rates include breakfast. Besides great rates, Holiday Inn's budget brand is very family friendly. If you can persuade teenagers to share a room with parents or grandparents and sleep on a sofa bed, kids up to 18 years old can stay free. A suburban hotel about three miles from York's major attractions, this property is within a mile of the convenient Monks Cross Park and Ride where you can catch a shuttle to the city center. Guest rooms are basic and functional - so good for a stopover rather than a vacation. A hot breakfast buffet is included in the rate but WiFi is not. The Heworth is a 4-star guest house is under a mile from the city center. Rooms are simply but nicely done and all have private bathrooms and digital TV with Freeview. The accommodating hosts will prepare a full English, vegetarian or coeliac breakfast. Rooms are wired for ethernet broadband and wifi - both free. The Grange Hotel is a 5-star, award winning luxury B&B, this is a charming restored Victorian house. Both the city center and York Racecourse are less than a 10-minute walk. Rooms here are bright, sparkling clean and very pretty. All have new ensuite facilities with either bath or bath/shower combinations. There's a 5% surcharge for Visa credit cards but with double rooms at under £50 per night for two - even in the high season - it's hard to quibble. Rates include breakfast and food allergies can be catered for with advance warning. The guestrooms in this pleasant and conveniently located B&B look like the spare rooms in a houseproud friends home. All have color TV, tea and coffee making facilities, hair dryer, complimentary bottled water, and an iron and board. All are ensuite with showers and include free wifi broadband service as well as guaranteed parking. Unassuming on the outside, this B&B, close to the Bootham Bar entrance to Old York and to Museum Gardens, is quite pretty and comfortable on the inside. Breakfasts are home cooked to order and include homemade bread. EnjoyEngland - one of the UK's official tourist groups - has given it 4 stars. Rates quoted are per person but still well under the £100 per room per night threshold.